Ou Island has a perimeter of only two kilometers, with a drive around the whole island taking about five minutes. The island is full of excitement during the haaree boat races, when rowers jump off a bridge into the water to climb into their sabani. Numerous tempura shops at the base of the bridge sell fresh seafood tempura at reasonable prices, a treat for locals and tourists alike. 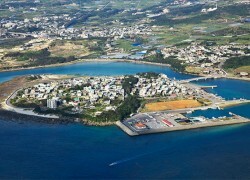 Situated right next to the bridge is a typical Okinawan white sand beach that is enjoyed by locals.